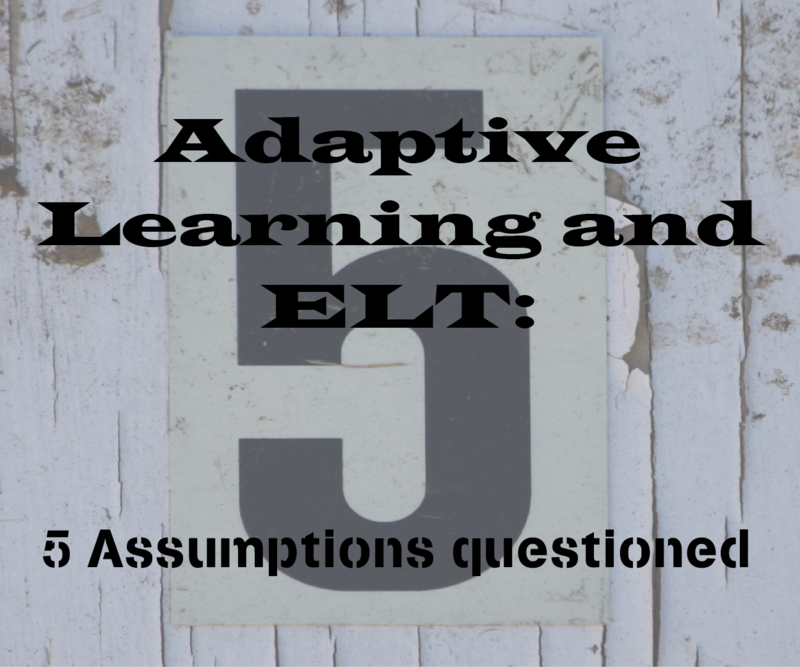 Where are we going with Adaptive Learning and ELT? I’m a little worried we might be mapping our path before we’ve seen it. So here are 5 assumptions I’ve identified from our posts on the subject so far, and my thoughts on each. 1. English as a Second Language is a special subject. As good teachers, we think our subject is special. Naturally enough, as English – nay, language teachers, we think our subject is especially special. Language is alive and subjective, science is not! I put it to you, good readers, that the only difference between ELT and, say Maths, is that it’s harder to convince people that abstract grammar skills are useful without an ability to use them in practice. Maths is catching up though, and Dan Meyer leads the way (with some very ELT-like communicative methodology). If you haven’t got time for the video: simply substituting formulae for word problems (if little Johnny has 3 apples…) does not teach you how to use Maths to model your world. Just as knowing how to complete ‘If I _____ (be) you…’ doesn’t teach you how to actually use 2nd conditional. The view of Maths as somehow more amenable to Adaptive Learning is one that sees Maths as stuck in a Grammar-Translation world. My view is that if we think Grammar-Translation and fill-in-the-gaps is the only place Adaptive Learning can take us, then it’s not the educational game-changer it should be. 2. Using technology is not communicating. Another assumption is that if we’re using technology (especially EdTech), we’re not communicating. Indeed, some of us feel that we need to get as much of the technology bit done outside of class to free up class time for ‘real’ interaction. Yet you don’t need to go past your local bar (or classroom) to see that technology is an integral part of how we communicate with people in face-to-face situations. And any teacher who has heard a robotic dictionary voice in their class will know that comment extends to EdTech too. The challenge in Adaptive ELT is how do you integrate technology with both an educational and communicative purpose. 3. Adaptive Learning happens outside of class. 4. Adaptive Learning needs algorithms. Based on numerical data. 5. Adaptive Learning is about content. The problem, as we see it, is how teachers push the right content to students at the right moment. As teachers, we know that we could improve our classes if only we had more flexible content to respond to our class better. My thesis here is that we first need to understand our class better. If an emergent syllabus is truly an aim, then we need to capture and measure student content, not just improve flexibility of teacher content. The first is far and away easier to create. But as teachers we should be pushing for the second as well. I see your central point. Though I would add that I think the second system is in fact easier to create. The first one requires a system that works independently of a teacher. The second is merely information to help a teacher make a decision themselves. I do know if I agree that it is easier, but I would agree that the second would help language teachers quickly and constantly get better. Wow, what fun it would be to build a taxonomy of the information machines could collect and organize that would be helpful to both new and experienced teachers.